The Islamic Educational, Scientific and Cultural Organization (ISESCO) has issued a statement on the 20 January tragedy for the first time. 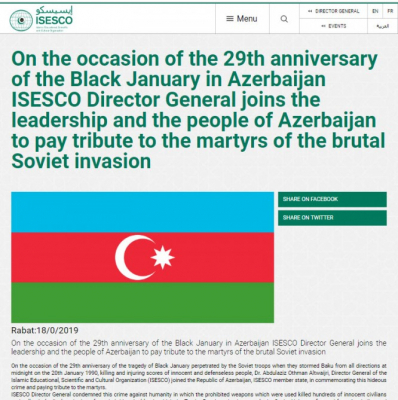 The statement says: “On the occasion of the 29th anniversary of the tragedy of Black January perpetrated by the Soviet troops when they stormed Baku from all directions at midnight on the 20th January 1990, killing and injuring scores of innocent and defenseless people, Dr. Abdulaziz Othman Altwaijri, Director General of the Islamic Educational, Scientific and Cultural Organization (ISESCO) joined the Republic of Azerbaijan, ISESCO member state, in commemorating this hideous crime and paying tribute to the martyrs. ISESCO Director General condemned this crime against humanity in which the prohibited weapons which were used killed hundreds of innocent civilians and collectively displaced others from their historical lands.